As with many urban fantasy detective novels, Whispers Underground starts with the discovery of a body. On this occasion its an American exchange student with a wealthy, politically powerful family who is found brutally murdered at the far end of the Baker street tube station. With the pressure of an American Senator on his back, London constable and sorcerers apprentice Peter Grant has his work cut out as investigations lead him through the darkest depths of the largest and most dangerous subway system in the world. Whispers Underground the third novel in the series and if anything the story seems more measured with a greater degree of structure than the previous books. This is especially evident in the storyline which feels much closer to an urban fantasy police procedural than it has previously. 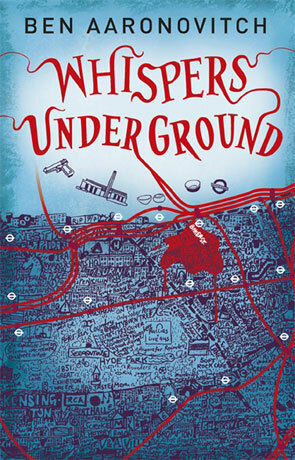 Should you read the first two novels before reading Whispers Underground? I wouldn't say that it's essential and there is a small number of reminders about what's happened so far but I really would encourage the reader to do so. Not only are there a number of references to past events but the story itself does feel very much like "the continued adventures" rather than a stand-alone book. I love how the author manages to keep the story fresh, there is still so much to learn about Nightingale, the Folly and the whole system of magic and Aaronovich really draws the reader into this hidden world of river gods, vengeful spirits and renegade sorcerers. Even though this is the third time we've met Peter and entourage I still feel that there is a huge amount of life left, plenty more tales to tell and I'd love to see how the characters develop. The other quite incredible part of this book and the series in general is the insight into the Metropolitan police force, it feels just so realistic and plausible with a self-depreciating humour that manages to avoid becoming insulting or degrading in any way. This feeling of belief is re-inforced by the inclusion of references to contemporary works such as Harry Potter and there are a number of great one-liners. The quality of the writing is superb with an instantly engaging style and subtle humour that makes reading the novel a real joy and almost impossible to resist. The voice feels quintessentially British, a feeling that is quite powerful and yet difficult to quantify. Characterisation is very effective and Peter, Lesley and even Nightingale really do grow, develop and mature as the book progresses. By the end of the book Peter is much more confident and comfortable in his role as apprentice magician detective; it feels a little like a Dark Knight Rises moment and is very effective. The ending is pretty dramatic and very much a seat-of-your-pants cliff hanger that really does leave you wanting more, I can't wait to read more in the life of Peter Grant. Written on 6th July 2012 by Ant.